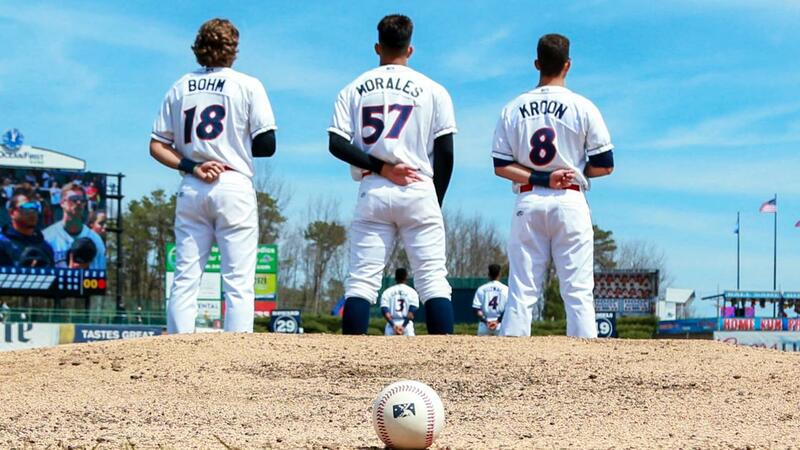 The BlueClaws are back home for a three-game series with Lexington beginning Thursday. The BlueClaws will be back home at FirstEnergy Park for a three-game homestand against the Lexington Legends (Royals) beginning Thursday night. The series marks a rematch of the 2018 SAL Championship Series won by the Legends three games to one. Order Tickets - Call 732-901-7000 option 2 or order online by clicking here. Thursday, April 18th (6:35 pm) - It's the second Thirsty Thursday of the year, presented by 95.9 WRAT. Join the fun in the BlueClaws Biergarten for dollar Coors & Coors Light drafts, plus wings from Quaker Steak & Lube (6-for-$5 standard wings and 50-cent boneless wings). Join the Thirsty Thursday Club (more here) and you'll get 10 undated tickets that can be used at every Thursday home game plus access to a VIP line in the BlueClaws Biergarten! Kids Run the Bases after the game. It's also a Silver Sluggers Thursday where Seniors Eat Free thanks to CareOne. Friday, April 19th (7:05 pm) - It's Seven Kingdoms of Claws Night (RWJBarnabas Health). Guarantee your Seranthony "The Knight" Dominguez Bobblehead with a BlueClaws Membership Plan (more here). Membership Plans include tickets to five (or 10) top games of the year, all fireworks nights, premium items, plus food at each game, mini golf at each game, and a game ticket for the Toyota World of Lakewood Home Run Pavilion at each game. The only way to get a bobblehead is with your BlueClaws Membership Plan. Seven Kingdoms of Claws Night will include special promotions, character appearances, and post-game fireworks too! Saturday, April 20th (4:05 pm) - The brief three-game homestand wraps up on Saturday with a 4:05 pm game. Kids Run the Bases after the game.